The biggest hydropower project in the private sector stuck in financial troubles since its start ignites stiff opposition from local tribal communities. The Karcham Wangtoo Hydroelectric Plant is a 1200MW run-of-the-river hydroelectric power station on the Sutlej River in Kinnaur district of Himachal Pradesh, between the villages of Karcham and Wangtoo. It is today the largest hydroelectric project in the private sector in India. The history behind this project is of particular relevance for the valley and for the entire state, as the dam played a critical role in the formation of public opinion around hydel projects. From this struggle, in fact, many more local committees have drawn inspiration and a reason for resisting, contesting, not accepting the conditions imposed. The struggle is still ongoing, and will be a legacy for any company who will take over the project in the next future. Jaypee Karcham Hydro Corporation Limited, a subsidiary of Jaypee Group signed a memorandum of understanding to develop the dam in 1993 with an initial capacity of 1000MW. After years of delays, construction on the power station began on 18 November 2005. The Karchham-Wangtoo project is planned to utilize the head available between the tail waters of Baspa-II hydroelectric project and the head waters of Nathpa-Jhakri hydroelectric project. In 2012 it was registered for CDM benefits . The project has often been in financial troubles and Jaypee sought to sell it to other companies, first the Abu Dhabi National Energy Company PJSC (TAQA), and then Reliance. Both negotiations failed until finally the project (along with its other project Baspa II) was bought over by Jindal Steel Works for Rs. 9700 crores in Sepetmber 2015. Owing to the experiences of the Natha Jhakri and Baspa projects in the district this project faced local opposition right at the outset. The Environment Clearance public hearings for the project, in 2003, had to be repeatedly postponed after the company failed to make the relevant impact assessment studies available in the local language. Despite objections and protests the Environment Clearance to the project was granted. By 2006 the movement had gained some momentum and on 9th December 2006 people of the affected villages rallied to Wangtoo as per the wishes of the devta (their local deity) to set up a symbolic shrine and vow that work on the project would be stalled. Section 144 had already been declared by the local administration here to stop any kind of public demonstration. When the rally reached the site, Kaksthal, the police lathi-charged and fired at the silent procession injuring several people. Key leaders of the movement were arrested. After demands for inquiry into the incident a committee was formed for the same and despite reports that the District administration was responsible there has been no action by the HP government in the matter till date. The repression at Wangtoo succeeded in diffusing the local movement and the two villages, Sapni and Kanhai, who lost 1650 bighas of land in the project, were the first to back out of the struggle, giving a No Objection Certificate (NOC) to the project. 6 villages under which the Karchham Wangtoo project’s 17 km. tunnel passes through, but whose lands were not being acquired for the project, were not even considered as affected and neither were NOCs sought from them. These villages have seen cracks in houses due to the drilling and blasting for the tunnels and new landslides have become active in the area. More than 800 petitioners from these villages are now fighting a legal battle for compensation for the impact of the tunnelling which has led to drying up of natural springs (the only sources of drinking water and irrigation for apple orchards). Kinnaur falls in seismic zones IV and V, which means it runs the risk of damaging and destructive earthquakes. Also, its young mountains lack deep-rooted vegetation making it prone to frequent landslides. A massive construction plan of hydropower stations, tunneling and transmission lines is a severe environmental matter. First, the river ecology is disrupted as dams are barriers impeding the life cycle of migratory species of fish; second, landslides and floods due to debris deposits have been registered at many places and third, groundwater sources are visibly drying up and agriculture is suffering as well. Following testimonies from local villages on water leakages from the tunnels, Himdhara filed several Right to Information Act applications to the Irrigation and Public Health department in order to get the due information . This revealed that so far there is no authority in the state to control and monitor the safety and water flows as required by the Hydropower Policy 2006 of the state of Himachal Pradesh. In the meanwhile, several hydropower projects have been or are being constructed, and some are ready for commissioning even in the absence of any monitoring authority. The responses also disclosed that by 2009 almost 43 out of 167 (26%) of water sources had dried up and in many other severely reduced, and this only in villages located in the area affected by the Karchham Wangtoo project, therefore other project areas are expected to present a similar situation . Similar data has been in fact provided for four other project sites in different parts of the state, and recently also in the area around Sawra Kuddu dam (see related case). The EIA studies have overlooked the issue of tunnel related impacts. In fact, villages located on the mountainside through which the tunnel passes are not even considered as affected villages, but are now facing increased risk of severe erosion, landslides, cracks and damages to houses as a result of the blasting activities. The muck removed from the tunnels is also dumped along the river banks, which is eventually deposited on the river bed forcing the water to flow at higher levels thus posing danger to nearby areas. Local agriculture and fruit orchards, including Kinnauri well renowned apples and forest products like pine nuts have been severely damaged by dust coming from excavations and blasting, so locals have lost their first sources of livelihood. In 2014 the Indian Council of Forest Research and Education with several other institutes conducted a Cumulative Environmental Impact Assessment in the basin, commissioned by the Directorate of Energy. The final report was presented in December 2014 to communities in Kinnaur, mostly Scheduled Tribes. They heavily criticized the report, claiming it to be pro-hydro and biased against them. They challenged the fact that the report had failed to include the impacts of the three major projects, namely, Nathpa Jhakri, Karchham Wangtoo and Baspa HEPs which would have brought out the major issues being faced as a result of hydropower development. They complained about the fact that issues like impacts of massive muck dumping and air pollution due to dust during the construction period find no mention there. They also pointed out that the report had no baseline data. “It is unclear as to how the consultants arrived at any conclusions without availability of baselines” said Prakash Bhandari of Himdhara, Environment Research and Action Collective . The panel was also questioned that the study did not look at very critical issues for instance the impacts of tunneling for these projects. According to Himdhara, the recommendation which came out as most controversial was on the “no-go areas for Hydropower”: the study report mentions in the end about declaring certain areas as “no-go” zones for hydropower projects given the biodiversity, impact on fish fauna and the fragility of the trans-himalayan region. But this point in the report has been deliberately kept ambiguous and not put under the section titled “recommendations”. 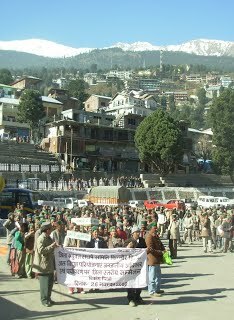 Representatives from Hangrang Valley in Upper Kinnaur insisted that this be included as a recommendation else they would boycott the entire proceedings. Shanta Kumar, representative of the Hangrang Ghati Bachao Sangharsh Samiti said that there was severe opposition in the valley to hydropower projects. “We are very clear that the experience of the project affected villages in the lower Kinnaur and other areas in the river basin has been negative. If the government calls this ‘development’ they need to prove it first by making the local opinion in the areas where projects are operational as favorable. “Otherwise in a sensitive border area such forced development that goes against the people will lead to serious anti- state sentiments”, he added." Environmentalists have been demanding that some sections be left untouched for conserving the fragile environment and also for allowing free flowing stretches of the river, which otherwise would totally be diverted into tunnels, making the mighty Himalayan river into a vanishing river. In March 2015, some 1300 workers and daily wagers of the Wangtoo-Karchham and Baspa II projects joint the protest at the construction site, and raised their voices to demand better wages and working conditions, together with more safety measures to be taken by the company ; they also raised the fact that the company has not even obtained the No Objection Certificate from the Labour Department, indispensable for starting the works. More than 100 workers have died since the start of the construction, many were not even registered. Illegal labour is one of the most said and untold stories behind the construction of large infrastructures; profits and speed work is only possible through kind of silenced exploitation. While the Jaypee Group has installed a 1,200 MW capacity at the location, its techno-economic clearance is for only 1,000 MW. The final capacity is still to be defined, as well as the electricity tariff. The Project envisages a concrete gravity dam of about 43m high above the river bed. The dam will have six sluice spillway bays of size 9m (width) x 9m (height). The other main components are a 10.48m diameter, 17.2-km long headrace tunnel; 4.75m diameter four pressure shafts; an underground power-house with 4x250 MW installed capacity; and transformer hall and 909m long and 10.48m diameter tailrace tunnel. For evacuation of power, a 216 km. long transmission line has been set up with total cost of around Rs.1,000 crore by Jaypee Powergrid Limited, a 74:26 joint venture between Jaiprakash Power Ventures Ltd. and central transmission utility Power Grid Corporation of India Limited (Powergrid). Why? Explain briefly. While the project was constructed and is in operation it raised, in the Satluj valley and Kinnaur, the struggle by the local people has led to widespread awareness about the issues related to the socio-economic and environmental impacts of hydropower projects. Even vis a vis the articulation of demands and use of democratic and legal spaces to raise the issues has come to a large extent from this conflict. However, this agreement did not go through; JP later engaged into negotiations with Reliance Power in a Rs 12,000-crore deal in 2014. In the meanwhile, JP installed 1,200MW capacity on the plant and negotiated the price according to that, while the Technical and Economic Clearance it got from the government was only for 1,000MW. Both the Central Electricity Authority and the Himachal Pradesh State Government had expressed safety concerns on allowing the plant to operate at that potential so they forced the company to operate at 1,000 . This led the negotiation with Reliance to fail and even a further one with JSW Energy to tremble . Finally, JP reached an agreement with Jindal Steel Works, which is still under negotiations (as per August 2015).